This machine is for cutting granite and marble blocks in small size, the combination of multiblade with different dimension increases working efficiency, it adopts two-slider frame structure, driven synchronizely by double screw, high stiffness and stability. The Bridge Multi-Blade Block Cutter adopts a large-span bridge type and beam structure, and is good for cutting small granite and marble blocks with multiple blades round in shape. This Granite Block Cutting Tool can be used to cut granite with an optional blade. The combination of multiblade, in disc block cutter, with different dimension increases working efficiency, it adopts two-slider frame structure, driven synchronizely by double screw, high stiffness and stability. Adopting built-in dual-cylinder lifting mechanism and adjustable side plates, the Bridge Multi-Blade Block Cutter has a great improvement on cutting precision and efficiency; with dual-axis spindle box, the Granite Block Cutting Tool can fulfill cutting task in one time and dispense with the need for discharging the slabs when cutting blocks. Adopting teeth bar, the slab-partition drive mechanism of Bridge Multi-Blade Block Cutter possesses higher precision with less clearance. Compact structure, convenient operation, automatic, low work intensity, and fast producing efficiency and high percent of regular product, Bridge Multi-Blade Block Cutter is preferred equipment for cutting large-size blocks. 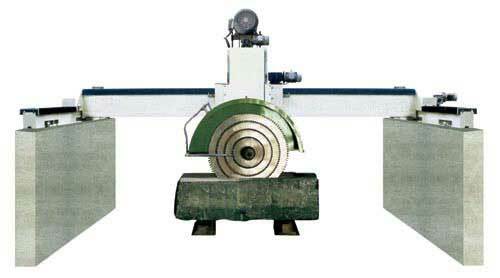 With frequency control, the Bridge Multi-Blade Block Cutter runs steadily and has less risks of damage. Yuxiang is a specialized manufacturer of stone cutting equipment, including Bridge Multi-Blade Block Cutter, disc block cutter, Granite Block Cutting Tool, block saw, Bridge Cutting Machine, hydraulic stone cutter, granite stone cutter, marble cutter.